Lemax Santa Claus Is Coming To Town musical table piece depicts the delightful Christmas eve scene of Santa's Sleigh being pulled by his reindeer circling the sky above rooftops. Santa's Sleigh carries Christmas presents to the delight of the children beneath. Father Christmas flies over the snowed scene beneath, where Children are putting the finishing touches to their snowman, amazed at the sight above. A musical soundtrack jingle plays to accompany the rotation of Santa & Sleigh circling above. Lemax Santa Claus Is Coming To Town is an animated table piece suitable for placement in and amongst a seasonal Lemax village Christmas scene. A unique Lemax Caddington Village collectable table piece which joined the Lemax collection in 2005. Santa Claus Is Coming To Town offers a magical self standing 31.5cm tall Christmas village centrepiece. 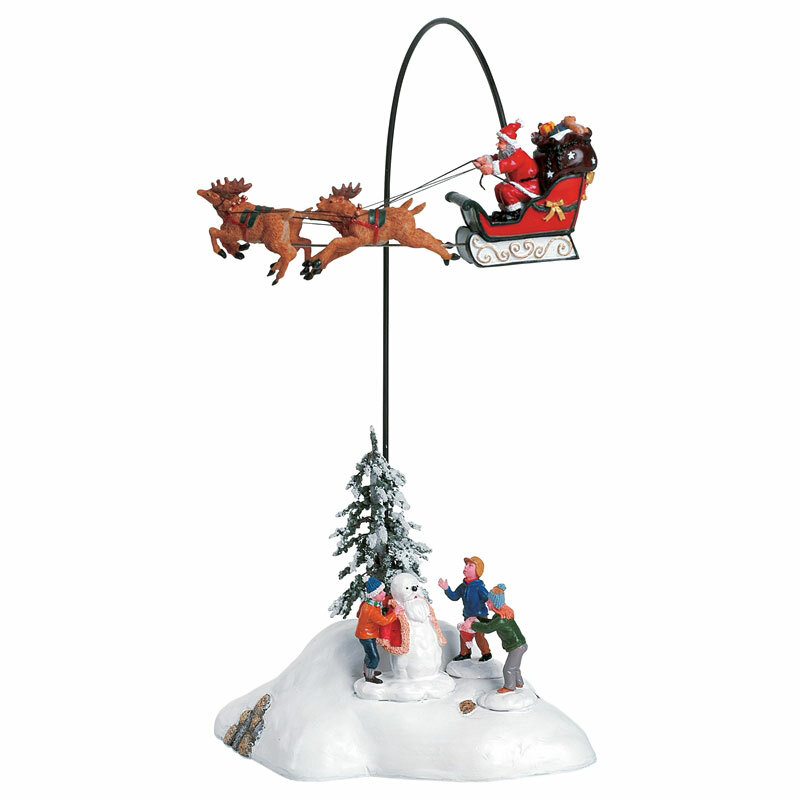 Supplied with rotational arm which rotates above an individual snowed base with figurines to compliment your seasonal Lemax Village.